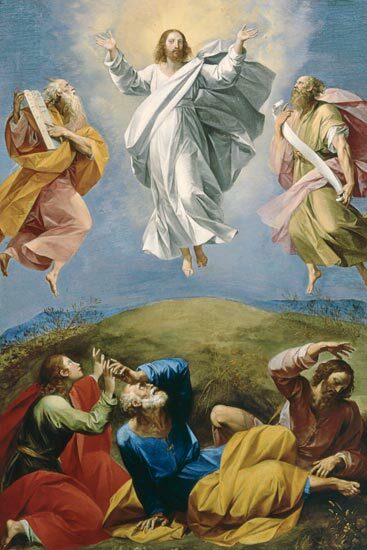 Paintings have developed a tradition to show Jesus and the other two floating around in the air. Is there any textual justification for this? None. (Aside: This is exactly how myths develop: one person hears a story, wants it to be dramatic, fleshes the untold details out in their own mind, and then adds them as fact when they present the story – without even realizing they’re making changes.) Changes regarding a hero’s story tend to exaggerate and glorify, so you can discount some of the frills. But there’s probably a commonsense basis for the story. The full moon comes out from behind the clouds, and catches Jesus’ face and his white robes, making them shine dramatically. There is a roll of thunder. You can make thunder say whatever you want it to say – Eliot records it speaking Sanskrit in The Wasteland. Simon Peter babbles, not untypically. So, what do you think? Plausible? Or you prefer the floating-around-in-the-air version?